Pay peanuts and you get Mad Mad Monkey, match a few bananas and peanuts together and you will be on your way to some massive wins in this chimpy jungle adventure. But, if you want to find out more about how to win some cash on mad monkeys then read on. Check out these slot games today! 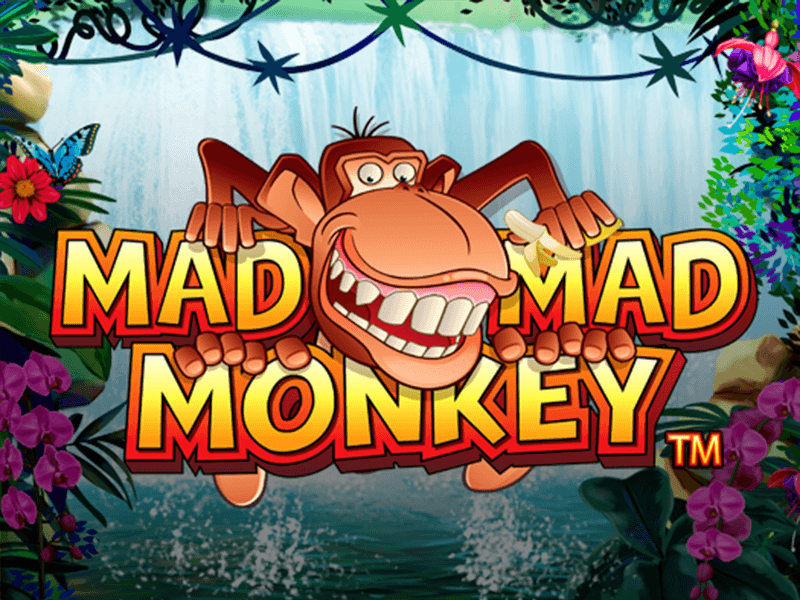 Go Ape with Mad Mad Monkey the madcap new slot games that’s really bananas! This one features some crazy monkey’s full of mad adventures and shenanigans! This is one of the craziest themes we have seen for quite some time and so far we are loving it! 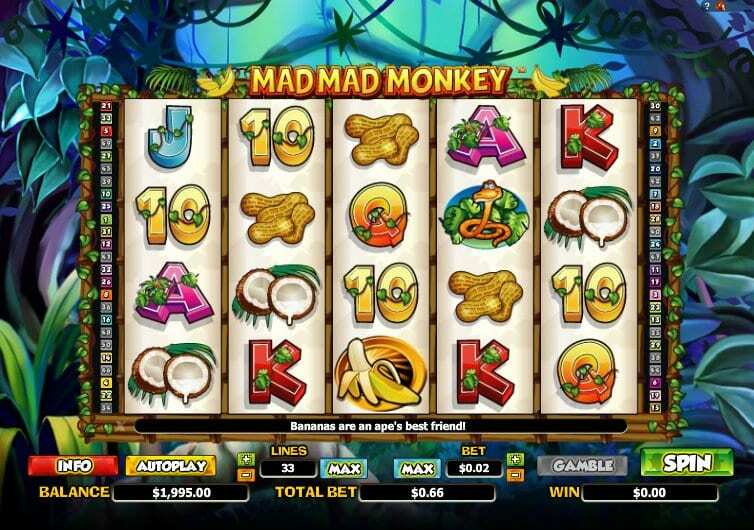 There are some great jackpots to be won and a fun bunch of features, so go bananas with the Mad Monkeys! NextGen gaming is the team behind this top-rated UK Slot and we think they have really done it justice, creating possibly one of the best slot games ever. They have a long pedigree of delivering some interesting games, with titles like Foxin Wins, and this one certainly fits the bill. As usual, you can expect tasty graphics and some nice in-game features, so another solid performance by Nextgen. It's worth a try to spin these slots games online! If you're up to venture to try the best slots, you are in the right place. Set in the backdrop of a lavish jungle this game is inundated with a real wild green theme, with lush tropical vegetation and fauna. The reels are also made from indigenous materials like vines. leaves and the local timber, and are the well-loved 5 reels 3 rows with a total of 50 variable pay lines. The poker symbols are also covered in the jungle theme, leaves and fauna making up the 10-A representing the lower values in the game. The local wildlife represents the higher value symbols, and in this bunch, you will find snakes and parrots, as well as the odd coconut and banana. You can score a great return by landing plenty of the high-value symbols. 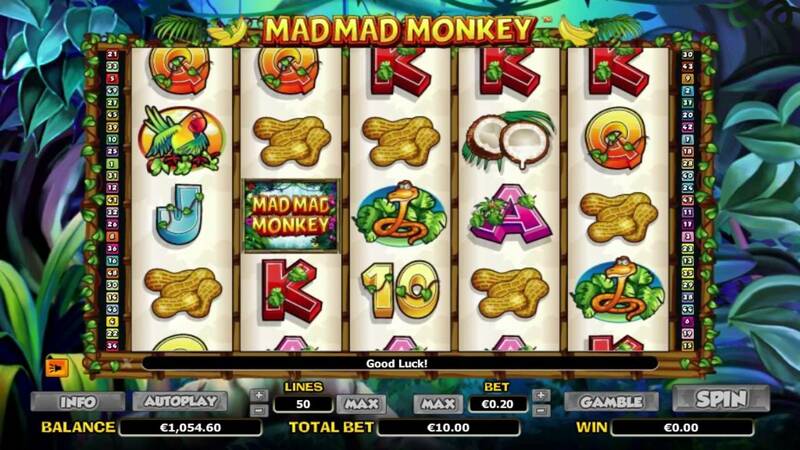 The wagering range is between 50p and £10 per spin – so not as huge a range, however, if you are monkey enough to score 5 bananas, at the full stake, you could win as much as £90,000 so that would really drive you Ape! You also have the opportunity to stack the bananas which also provides the potential for larger wins in the base game. The Mad Monkey is the key symbol in this one as he represents the wild multiplier symbol which not only substitutes for all the normal symbols but he also doubles the payout of any winning combination that he contributes to. The mad Monkey can appear stacked on the number 2, 3 and 4 reels to create the opportunity for a complete range of new winning combos! 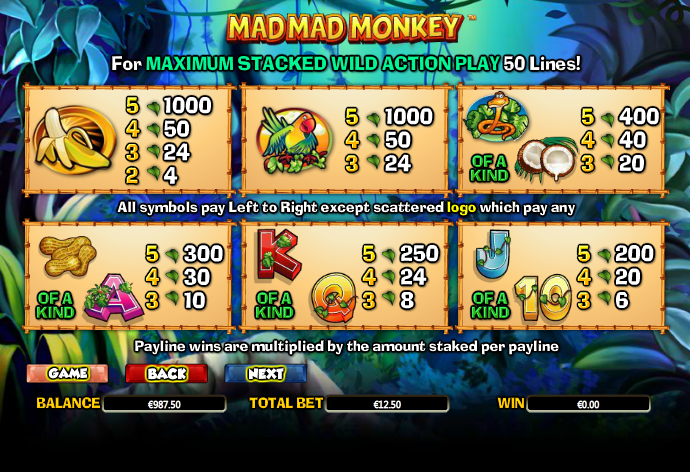 Our Mad Monkey friend isn’t the only bonus in this game, as the scatter is represented by the mad Monkey Logo which pays out for a winning scatter combination whenever 2 or more appear anywhere on the reels. If you score 5 scatters you will multiply your total bet by 400 so that’s a worthwhile bonus! Land 3 or more scatters anywhere and you will activate the Super Stacked free games feature which initially will give you 10 free spins. When you are playing these spins all your wins are trebled. But, if you land 3 more scatters you can win a further 10 free spins. The added bonus is that is a wild monkey is part of your winning combo during the free spins period, then your wins will be multiplied by 6. We love the theme in this game – who’d have thought that some Monkeys could be so much fun. You need to try and get to the super stacked free spins round as we think that’s a tremendously fun part of the game and a super feature. The added bonus is that this is where you can make the really big wins. There are still plenty of other features and bonuses to keep everyone engaged, so we think it’s a great game for all. If you get bored with monkeys why not switch to Santas with our merry xmas slot game.